As the war continues in Syria, so does the risk of deadly malnutrition for children. Special-nutrient rich foods, like those being distributed by the UN World Food Programme (WFP) can save their lives. 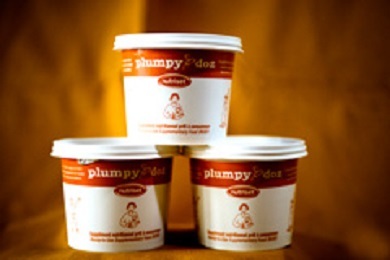 Plumpy’Doz is a nutritional supplement designed for children most at risk of malnutrition. The Nutributter is described by one its producers as being like a “daily multi-vitamin in a peanut paste” for children 6 months to 2 years of age. Both the Plumpy’Doz and the Nutributter are ready-to-eat foods specifically designed for areas suffering from conflict, disaster or extreme poverty. No cooking or special storage is required for this food to be eaten, making their distribution easier. A system of factories, including Providence-based Edesia, produce these miracle foods. These foods prevent children from suffering malnutrition. Children under the age of five will suffer lasting physical and mental damage if they become malnourished. So this concept of prevention is so vital in terms of planning a humanitarian response in distressed parts of the globe. Around 300,000 children in Syria will benefit from the Plumpy’Doz and Nutributter provided by WFP. The Nutributter is being donated by the United States as part of a continuing relief effort. It’s critical that aid agencies maintain the pipeline of this food, especially in a crisis as desperate as the one in Syria. The hunger facing Syria is so severe that the needs of the population will grow as the conflict continues. With access to parts of Syria being restricted by the government it remains an unknown as to the extent of malnutrition in these areas. Much more food aid may be required. It’s also less costly to bring in Plumpy’Doz and Nutributter earlier rather than having to resort to Plumpy’nut which is used to treat the most severe cases of malnutrition. WFP relies on voluntary funding and needs around U.S. $30 million dollars a week to feed Syrian war victims. Decisions made by the U.S. Congress on food aid budgets will have a major impact on Syria and other war and disaster afflicted nations. Plumpy’Doz and high energy biscuits are also being provided to Syrian refugee children in Iraq. Save the Children is also operating a large-scale infant and young child feeding program in Jordan.